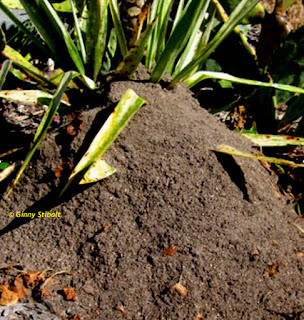 Anthill built into a yucca plant. A question from a reader: "We are trying to keep our yard as pesticide free as possible, however, we are having a lot of trouble with fire ants. We have a two year old who keeps getting worse and worse reactions to their bites. Can you give me any suggestions for dealing with the problem in a healthy way?" My answer: Oh, I hate those imported red fire ants and I too suffer from nasty reactions to their stings. - Boiling water works quickly: pour directly on the top of the hill in a slow steady stream so that it erodes a deep hole into the center of the nest. Warning: this will also kill any plant roots in the area. - Disruption and cold water will take at least 2 sessions. You dig or rake away the whole top of the hill and then pour a whole watering can (2 or 3 gallons) of water over the area. - Grits or rice poured on the top of the hill do not work. - If you must use pesticide, use a bait type which will be taken into the next by workers. - Never use a landscape-wide pesticide. I did not use boiling water on the anthill pictured here because it would have killed the yucca. I quickly raked the hill down to soil level with a leaf rake and then poured a whole watering can on the spot. I also poured water on it the next day and then they were gone and I did not receive any ant stings in the process. Yay! I was in central Florida and pulled over to snap some photos of these native 12' tall hibiscus (Hibiscus coccineus). 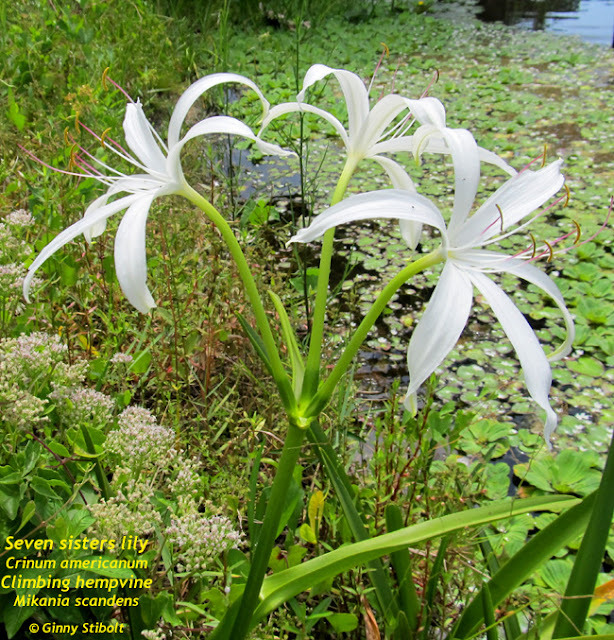 At Riverbend Park in Jupiter, I stopped to take a photo of this native seven sisters lily (Crinum americanum). Back in 2007, the people in this Clay County house that we pass on a regular basis planted 12 queen palms along their fence and directly under the wires. 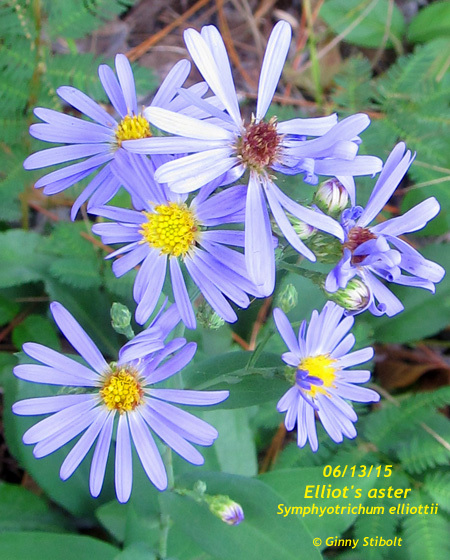 Only 2 of the 12 have survived the winters here in north Florida. 1) Queen palms are tropical plants and are NOT cold tolerant. If the temperatures dip below 25º F, most of its fronds will die. After a cold winter, if the palm's growing stem survives, it'll look terrible for six months or longer. 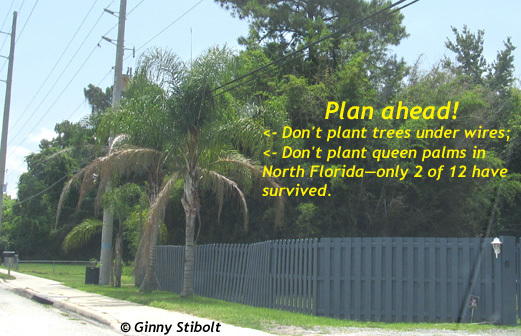 2) Unlike most palms, queens are not wind resistant. In a tabulation of trees lost in the hurricanes in 2004 and 2006, queens blew over twice as much as any other palm. 3) Queen palms are not drought tolerant and will require irrigation to survive our seven-moth dry season, especially during a prolonged drought period. 4) Queen palms produce a huge amount of seed, which quickly becomes a smelly mess. 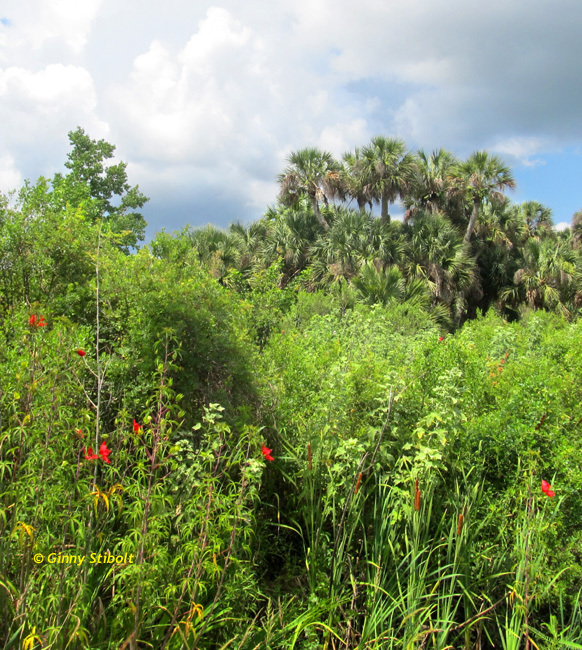 Plus in central and south Florida, queens palms have invaded our natural habitats and are listed on the II Florida invasives list put together by the Florida Exotic Pest Plant Council (FLEPPC). Our 5-month wet season began on June 1. You know it's summer when thunderheads are a daily occurrence. We thought we were going to get a nice cooling shower on a 95-degree day, but no. 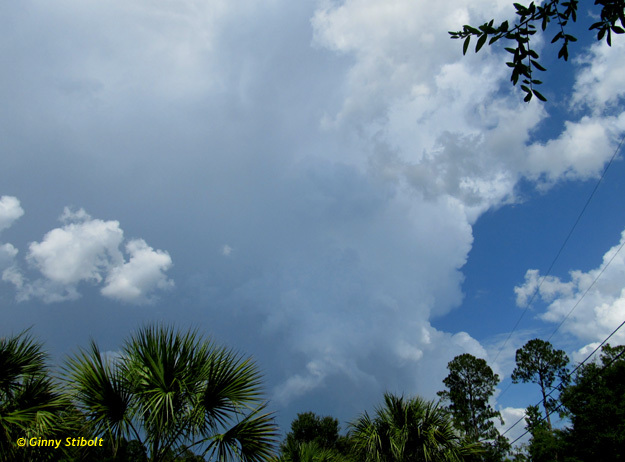 As ominous as this looked, it dissipated quickly and we didn't receive any rain this day. 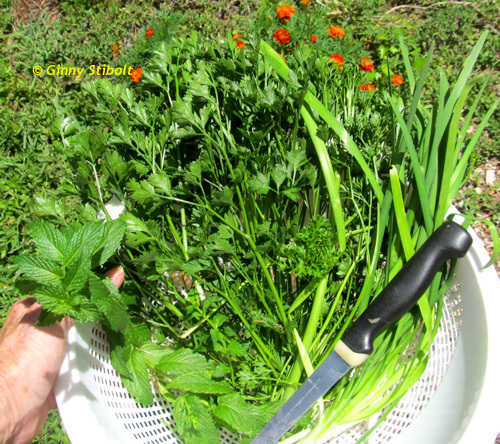 A tabbouleh harvest includes a sprig of mint, curly parsley, garlic chives, and meadow garlic bulbs (not shown) . The parsley has begun to bolt, so it's time to harvest it all. A good chunk of it went into a 3-day tabbouleh--so called because my husband makes enough to provide the main course dinner for the two of us for three days. For our tabbouleh recipe, read my post From compost to dinners. And if you look in the harvest photo above, you can see some marigolds growing among the Greek oregano. I've planted most of my marigold cover crop for the summer. The marigolds deter root-knot nematodes when planted as a cover crop and dug into the soil a few weeks before planting the fall crops. See my post Results: the nematode experiment for the details of the how and why. I have been filling up my dance card for this fall. Be sure to check out the Appearances Page to find public events near you.